I just got a fishing kayak and i am addicted to this fun sport. 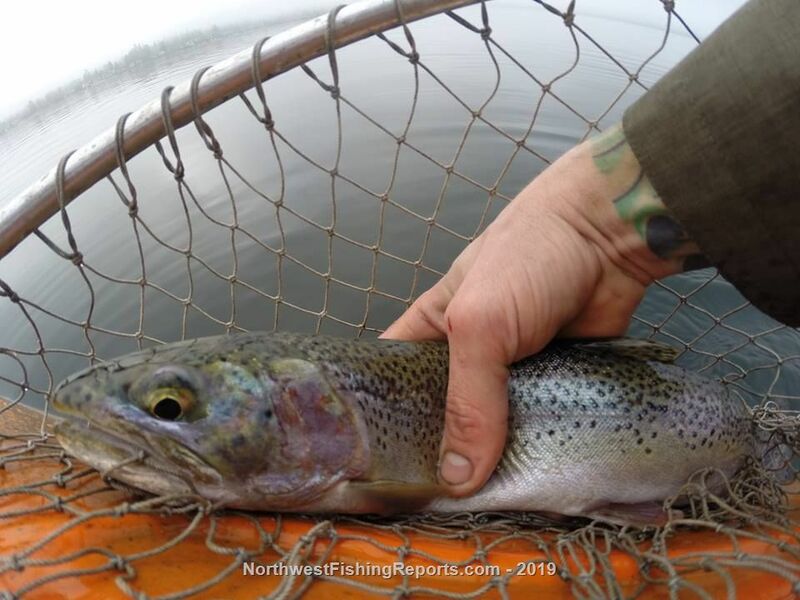 So far i have only used it three times all on lake Sammamish and every time I have caught fish consisting of cutthroat trout/ landlocked coho. It took me one outing of strict catch and release in order to be able to properly/confidently identify these fish but now that i know what to look for i have harvested a few and boy do they taste delicious!! Friday i spent maybe 3 hrs paddling around mainly on the east side of the lake and i landed 2 beautiful cutts and lost another. The 2nd cutt was a large hen close to 20inches long! Both fish were caught using a homemade wedding ring spinner in red tipped with Berkley plastic worm with a smile blade four colors out on lead core line. There was a bird and boat presence towards the weather buoy but i didn't spend much time in that area before i headed back in. After reading all the good reviews I just put in a order for Gods Tooth spoons by Elgin thru Greg's Custom Rods and could not be more stoked to get out this weekend and see what i can reel up. Also looking for some kayakers to befriend please reach out to me i would love to make some friends/connections. View other reports from jchennesc. Nice pics.....question for ya. Your rod holder looks to be a Scotty...if so, he way your rod is in the holder seems upside down for a casting reel in that holder, but then maybe you know something that don’t and I am always willing to learn. TMBob you are correct. I troll with it right side up using the rubber strap to secure it but when i am paddling or in between fishing or catching ill just stick the rod in like that. Thanks tho! Great way to get out there and fish! I'm one of the Mango colored Hobie's that is out there fairly often, caught two nice cutt's today! Congratulations on getting a kayak. It sounds like you're already addicted like many of us. You can catch a lot of fish from a kayak. Please be safe out there. Cold water is dangerous, so I'd strongly recommend a dry suit or other immersion gear while water temps are below 60 degrees. Your PFD will also save your life. 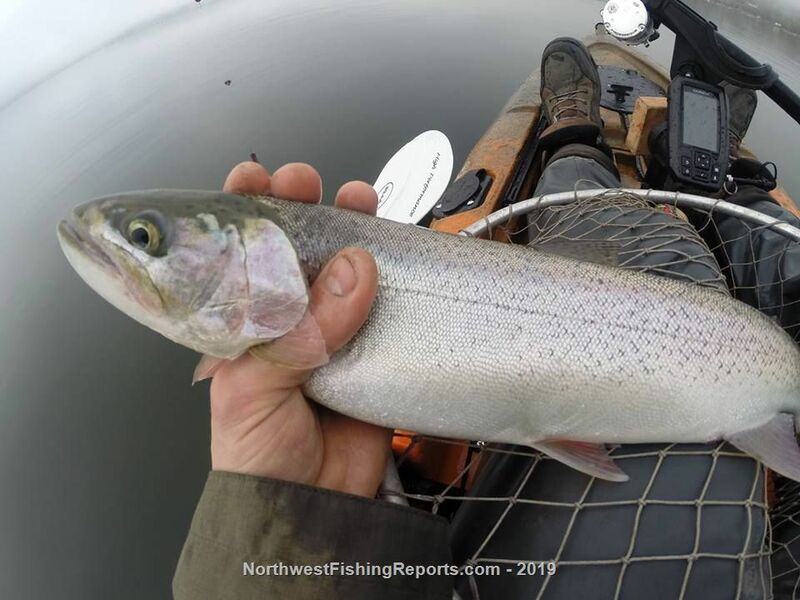 If you're on Facebook, head over to Kayak Fishing Addicts NW and Seattle Kayak Anglers. Both groups are great for meeting fellow kayak anglers. It is a growing community and Lake Sammamish is a popular spot this time of year. You can sometimes find up to 10 or more kayaks on the lake.